The most powerful thing the city does is make decisions about how land is developed. The city decides what kind of development is allowed on a given property, and how big. This is called “zoning,” which largely determines the value of the property. The city can also decide to change what’s allowed on a given property, thereby changing its value — “rezoning.” In short, big developers donate millions of dollars to municipal parties with the expectation that the parties will help increase the value of developers’ properties. Both the Non-Partisan Association (NPA) and Vision Vancouver are bankrolled by big developers. As Vision’s Geoff Meggs said in an interview with The Mainlander this week, of the millions of campaign contributions to his party, “the lion’s share comes from developers.” Vision split from COPE in 2005 in part because of the Vision faction’s pro-developer strategy. In 2005, of Vision Vancouver’s $1.3M in campaign contributions, a full $984,000 was from corporations — largely developers. By comparison, of $525,740.81 raised by COPE during its 2005 campaign, only $25,763 was from corporations. In 2008, Vision raised $1,704,258.81 during, and another $433,560.83 after the election. About 60% of this was from corporations, including half a million from developers (for a breakdown see here). At Vision’s recent fundraising gala at the Westin Bayshore, Nov 3 2011, the list of attendees is dominated by developers. The Non-Partisan Association has always been a developer party. During the 2008 campaign, the developer donations to the NPA equaled that of Vision: half a million dollars. The NPA’s current fundraising manager is Rob MacDonald, a right-wing developer and realtor. MacDonald’s fundraising pitch of September 2011, directed at developers, claimed that it is “unconstitutional” for the city to tax developers at all! The NPA expects to raise $2.4 million this campaign. No matter which way you slice it, Vancouver is one of the most unaffordable cities in the world. A recent RBC report showed that the average family would have to fork out over 90% of their income to buy an average bungalow, and over 50% of their income for an average condo. CMHC defines “affordable” as having to pay no more than 30% of household income on one’s housing. The big developers need prices to stay high in order to ensure maximum profits. To protect these donors, the NPA and Vision will go to great lengths to maintain the unaffordable status quo. If you watched Wednesday’s CBC mayoral debate, you would have strained to tell the difference between Robertson and Anton’s approaches. It’s like trying to differentiate between Pepsi and Coke at a taste-test — the difference is that there is no difference! If you listened closely, you’ll have noted that Vision has piloted two housing programs, both of which are in line with the NPA’s thinking, and a continuation of the NPA’s policy agenda when in office from 2005 — 2008: a) market incentives, and b) gentrification. Both developer-funded parties claim to want to increase supply of housing, even affordable housing. Despite the rhetoric, both plan to rely on the market, limiting themselves to “creative solutions” that offer developers “incentives,” which is code for developer tax breaks. Vision’s main “creative solution/market incentive” pilot program was called Short-Term Incentives for Rental (STIR). STIR was created as a stimulus initiative after the financial crisis of 2008 (hence the name “short-term”), which gives developers tax breaks to place rental covenants on unaffordable market rental units – without any rent controls. Anton correctly criticizes this program because about half of all condo units are already rented out anyways, and because it gives away too much to developers for too little in return. But then in the next breath Anton (and MacDonald) goes on to promise developers even more tax breaks (cutting “red tape,” DCLs, CACs, etc. ), expecting even less in return! Here’s the fundamental problem with relying on the big developers to increase affordable housing supply: they won’t do it, no matter how many tax breaks you give them. The tax breaks just add to their profits. You may have heard Anton talking about increasing the ‘supply’ of housing, but it’s all hot air. The developer oligopoly will not allow prices to go down — they will manage the market to ensure that prices do not go down. For example, after the 2008 financial crash, banks and developers choked supply of new housing development in Vancouver to ensure prices stayed sky-high. Before the crash, there were about 4,000 new condo starts per year, but after the crash that number fell to below 1,000 — this in a city that expects the population to grow at 10,000 people per year. The impact of this “controlled supply” (as Bob Rennie called it in 2009) will continue to be felt for the next few years. That’s the “dip” that Robertson was talking about during the CBC debate: “The dip we had through the worst of the recession really hit our city budget hard, it meant we had to really tighten our belts.” In other words, regardless of “incentives,” developers chose to hold-off on developments to keep profits high, and that forced the city to slash spending. All the “market incentives” in the world wouldn’t have convinced the banks and developers to build housing at that time. An even more preposterous idea is that affordable housing supply is low because there is too much “red tape.” At the CBC debate, Anton promised to create a “red tape commissioner,” and Robertson agreed that “we do need to keep improving the pace at which the city can process the demand right now.” But such a commissioner could only fulfill an ideological role of deflecting attention from the real culprits: banks and developers, who chose to constrain supply in 2008/9 to keep their profits high, and will do so whenever it suits them. The second “creative solution” that Vision has piloted is called “Affordable Home Ownership.” All of these pilot projects are located in the Downtown Eastside, and consist of building condo units that are far more expensive than the average unit in this low-income neighbourhood, some of them directly on top of former SRO’s and evicted hotels — so in the last analysis they only make the city more unaffordable. For a more detailed analysis, see here. Some units have interesting covenants on them, some don’t — which does nothing to stop the displacement of the low-income community. The NPA is also in full support of this gentrification. Similarly, at last weeks’s debate on homelessness, both Robertson and Anton said “NO” to Inclusionary Zoning (a policy which would include affordable housing in all new developments). 3. There are models in other cities that work better — and the developers don’t want you to know about this! Vancouver politicians cannot point fingers at the Province or at the Canadian constitution, either: it is a problem with Vancouver’s leaders. The City of Toronto has accumulated a social housing stock that houses 164,000 people, whereas the City of Vancouver Public Housing Corporation houses only about 500, while Metro Vancouver Housing Corporation houses only 10,000 through the entire Lower-Mainland. Where has the leadership been to expand this stock? The time for excuses is over. During the Mainlander‘s previously-mentioned interview with Vision’s Geoff Meggs, he could not commit, and had no concrete plan, to expand the public housing sector. Meggs was right to state that it’s a “classic deflection” in BC politics to blame “outsiders” for Vancouver’s housing problem. But just as importantly, we should actively learn from, and embrace, the public housing experiences of other cities — places like Hong Kong and Singapore. 4. You don’t need to vote for the developer-funded parties! The good news is that there is no need to vote for the developer-funded parties. The televised debate is designed to create the illusion that there are only two choices, which are in truth one choice (which is then not a choice at all). But there are many mayoral candidates, including Randy Helton of Neighbourhoods for Sustainable Vancouver. Even if Robertson or Anton wins the mayoral election, the mayor has only one vote on council. The other 10 councilors’ votes hold just as much weight. This election really is wide open, and anyone can win. There is no reason to vote for any of the developer-funded candidates. There are various other parties and individuals that have a real chance of winning. 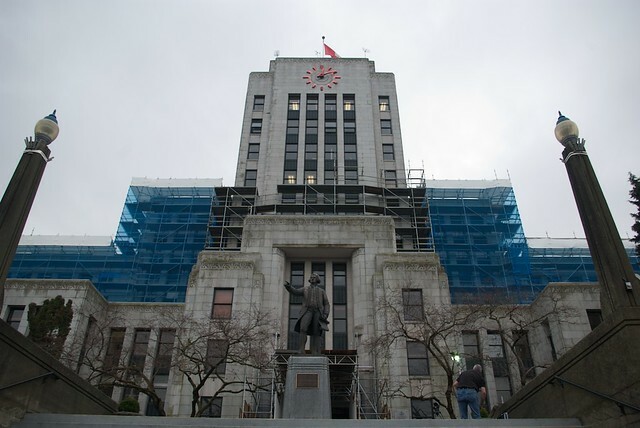 COPE will create the Vancouver Housing Authority, an arms-length authority charged with taking an aggressive lead on setting targets on home creation and coming up with achievable plans to make that happen. The authority will create semi-market housing and monitor the state of housing affordability in the city, building and maintaining housing separate from market development while also ensuring stronger inclusionary zoning laws are applied to all new developments. Futhermore, you can do much more than voting. The most important thing is to be involved at the grassroots level — that’s where change comes from. Sometimes parties implement ideas that come from the grassroots, but usually the parties have to be dragged there, kicking and screaming all the way. Certainly parties almost never generate the ideas. This is true for all sides of the political spectrum, and even the “creative market-based solutions” are generated by right-wing think tanks. The Occupy Together movement is resolutely against corporate greed and the corruption of democracy by corporate money. As to be expected, the two developer-funded parties have jumped on every opportunity to vilify the Occupy Vancouver movement. Ironically, government failure has led to increased problems of homelessness and mental health in our city, and Occupy Vancouver has had to pull the weight of caring for many affected people. And then the two developer parties attack the occupation for being associated with these problems! Despite all the public relations warfare, Occupy Vancouver has developed a better housing platform than these two parties (despite, or rather because of, the latter’s $4 million dollars). The General Assembly of Occupy Vancouver has adopted five “Housing Objectives” (they are not called “demands,” because there is no point in “asking” the developer parties to take action — the people must take action outside that system), which you can read here. Tomorrow, Sat November 12th 2011, a march titled “Housing is Right, not a Commodity” starts at the VAG at noon. 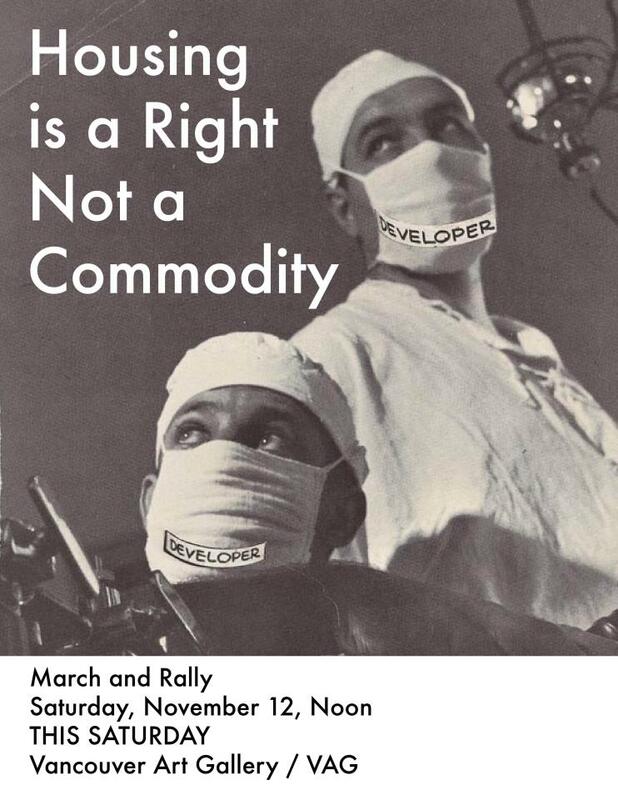 “Housing is a Right, Not a Commodity” march poster. As the mayoral race tightens, pressure will be exerted on everyone to get behind one-or-the-other of Anton or Robertson. But don’t flinch for a second, now’s our chance to start a new system. Occupy City Hall, the beginning is near. If COPE was really so concerned with affordnale housing and the influence of developers, they shouldn’t have continued their unholy alliance with Vision Vancouver. It is amazing how great a platform one can build when has license to ignore reality. Great stuff here. While I voted Vision in the last election and approve the bike lanes and some other things they’ve done, they’re record on development policies is becoming increasingly suspect. The reality you ignore is that of an immoral social structure where many of your fellow citizens are condemned to perpetual insecurity and degraded conditions in one of the most important human rights, that of shelter. Construction of rental housing by government is perfectly feasible and highly desirable. Only government can build at the levels required by the present situation. Furthermore establishing a high quality publicly owned rental stock would allow far stricter regulation of private stock with security of tenure. Many years ago, during and after university, I worked in the Chief Architect’s department of a large English local authority. Most of the work involved the construction of public housing, of a high standard and in large quantities. It was also economical because, given the ability of a fiscally prudent government to cover expenditure not directly financed from taxation by borrowing over the very long term at very low rates, and given an actually quite lean administration, the controlled rents and servicing costs were in balance. Unfortunately there, as here, neo-liberal ideology took over and became the established, unquestioned truth. Those structures were destroyed in favour of one so ineffectual that it can scarcely be called a structure at all, characterized by consistent failure to do anything with success except transfer large sums of public wealth to private interests in the form of incentives and subsidies. I was fortunate enough to buy what, at the time, was possibly the cheapest house in the city, now I’m a ‘millionaire’. I’m actually quite right wing! However the thought of my property taxes being diverted to corporations who have bought the system, to slum lords already receiving tax breaks and (in some cases) gigantic sums of public money, of these people being incentivized by a steady degradation of tenant rights because there is claimed to be no alternative infuriates me because it is wrong and a straight out lie. I support the COPE position, in fact I wish it went further. But how is it possible to vote for any of these people (except Tim Louis) when they are tainted as facilitators of the contemptible Vision record, contemptible by its failure, hypocrisy and most of all by the shameless exploitation of misery by which it was initiated?